Mix all ingredients except ice cream and white chocolate chips and spread 1/2 of it in a 8-inch pan which has been lightly greased. Add vanilla ice cream (softened to spread). 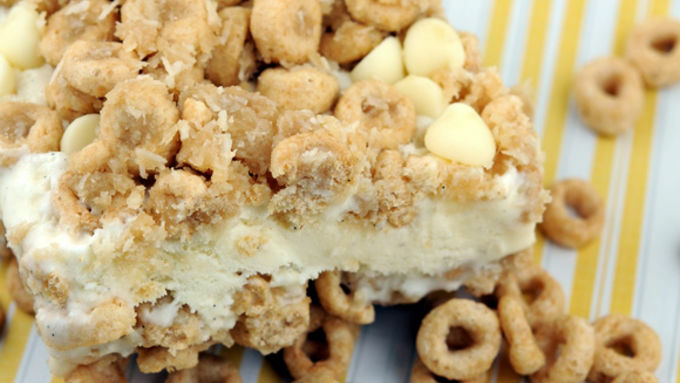 Add white chocolate chips to remaining cereal mixture. Cover ice cream layer with remainder of mixture. Let freeze covered for about one to two hours. When I was a kid we were the fun house on the block. My mother was the one that allowed sugared cereals (Count Chocula was my all-time favorite) while the other neighbor kids ate Grape Nuts (there are no nuts!) and Shredded Wheat. Cheerios were the only acceptable healthy cereal to me. The neighbor kids suffered through until the creation of their cereal savior…Honey Nut Cheerios. Finally they had a cereal that was good for them and had a hint of sweetness that they were being robbed of. 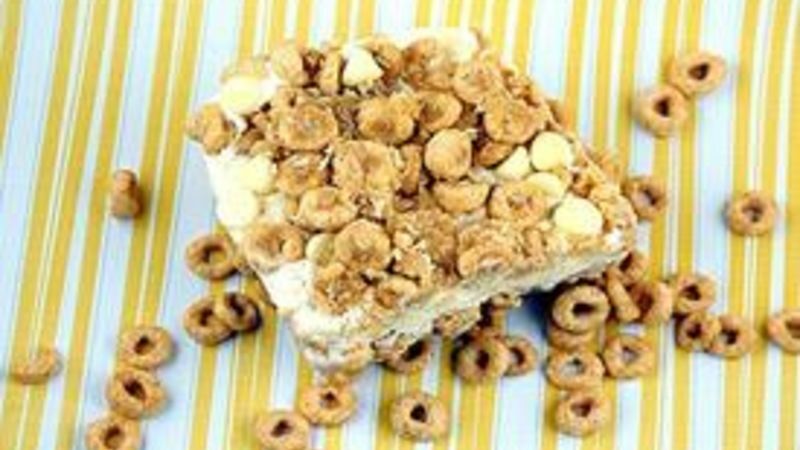 To honor my former neighborhood kids I made Honey Nut Cheerio Ice Cream Crunch Cake. I never really appreciated them until I got older. I got to have frosted cereal so it was no biggie to me like the other kids on the block. But how I do love them now. I’ve been known to steal them away from babies when they are spread out on their high chair (I would like to say I am kidding, but I am not). I even at one point owned a stuffed version of the Honey Nut Cheerio mascot, BuzzBee. Which, sadly, met an early death thanks to my dog. This is the perfect treat right about now as the summer is in full swing and the last thing most people want to do is turn on their oven. Of course what makes it even better is that they’re beyond simple to make. 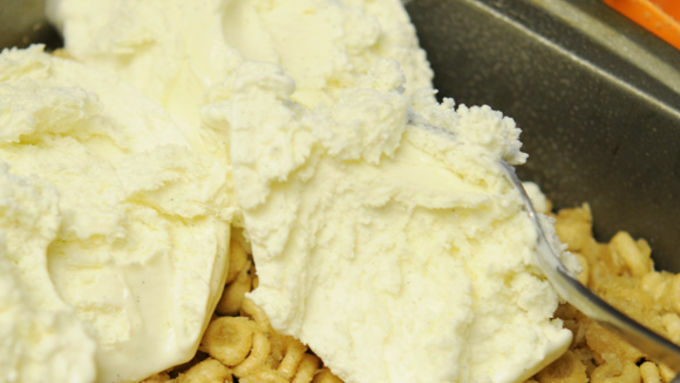 The hardest part is spreading the ice cream over the cereal. Save yourself some time and use store bought ice cream. If you are the type of person who makes your own ice cream feel free to substitute it for the store bought. You'll love serving up this frozen treat on hot summer days!